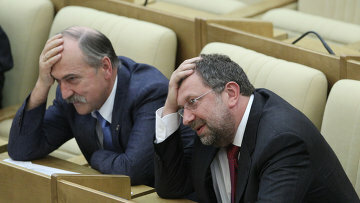 Control over MPs’ earnings ineffective | Russian Legal Information Agency (RAPSI). As of this year, members of parliament from both houses and regional legislators must submit income information to parliamentary commissions under Federal Law No. 329-FZ dated November 23. Their reports must be filed annually by April 1. Reports must contain information about their income and assets – as well as those of their family. However, it is clear that such measures of control will be useless if for no other reason than because the controllers and the controlled are the same people. Federal legislation contains specific restrictions and prohibitions to be observed by senators and lower house lawmakers. They are prohibited inter alia from having business and other gainful employment besides teaching, scientific research and creative activities if not financed by foreign nations or international organizations. Neither senators nor deputies may belong to company or enterprise management. They are also prohibited from belonging to foreign NGO supervisory boards, as well as boards of trustees. Similarly, senators and deputies are banned from receiving rewards from entities or individuals. All gifts received while they are in office are federal property. They must be handed over to the state and they may be bought back if one wishes. The personal use of government equipment, funds and information is also banned. Parliamentary commissions will conduct inspections only after receiving “sufficient written information provided in a due manner,” according to the law. Thus, only senators and deputies about whom such information is received will be subject to inspections. This data will be publicly available on the Federal Assembly websites. Law enforcement and tax authorities, political parties and NGO management, the Civic Chamber and national media will be able to file the information. Anonymous applications will not be accepted .The public will not be allowed to appeal to a parliamentary commission. First, they will have to inform media or an NGO about the incompleteness of the data sent by senators or deputies. It will then be channeled to a parliamentary commission. Both houses of parliament will establish an inspection procedure themselves. A commission should have the ability to file queries with prosecutor’s offices and other government authorities to ensure the efficiency of its work, as they may have information concerning the income and assets of senators, deputies and their families. The authorities are bound to provide the requested information. Meanwhile, although the commission may grant such power, this is not stipulated by law. New legislation also seeks to guarantee transparency of the control measures. Both houses will determine the procedures for placing information about their members’ revenues and property on their websites, as well as for giving the media information. Inspection results will be considered during commission meetings with the participation of journalists. Should a senator or deputy knowingly provide false or incomplete data about his income or assets, the incident must be published in the Parliamentary Newspaper and posted on the house’s website. The law provides no specific liability for submitting false or incomplete data on revenues and assets and this is an obvious drawback. As for the failure to comply with restrictions and prohibitions, senators and deputies who are found guilty will be stripped off their powers before their tenure expires. Ultimately, the results of any given commission's work will prove the efficiency of these measures – or lack thereof – in terms of combating corruption. The progress of anti-corruption legislation implies that control over earnings must be supplemented by control over senators’, deputies’ and public servants’ expenses, as international conventions require. Without this control, the work of parliamentary commissions will be senseless.